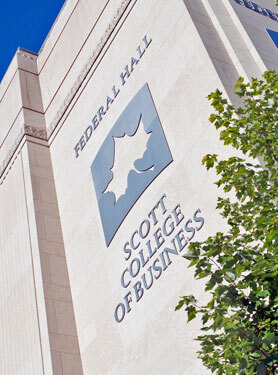 The Scott College of Business has many student organizations. These organizations provide a rich set of experiences and friends that enhance the classroom education. Within the organizations, business students can learn networking skills, meet successful alumni, listen to executives speak about their fields, make company site visits, and ask questions. Advice is available from students who have just navigated through the curriculum. Here are many opportunities to develop leadership skills as officers of these organizations. Alpha Kappa Psi - The main focus of Alpha Kappa Psi is to provide leadership development, personal and professional training and the fundamental ingredient higher education misses—experience. Through professional development, educational programs, community service and a hands-on application of formal education, Alpha Kappa Psi students use the business skills they are taught in the classroom to acquire life skills such as the art of compromise, consensus building, project management, team building and networking. Mu Omicron is ISU's chapter of Alpha Kappa Psi. American Marketing Association - The AMA is the largest marketing association in North America. It is a professional association for individuals and organizations involved in the practice, teaching and study of marketing worldwide. It is also the source that marketers turn to every day for information/resources, education/training and professional networking. AMA members are connected to a network of experienced marketers nearly 40,000 strong and include leading marketing academics, researchers and practitioners from every industry. APICS - The Association for Operations Management is the global leader and premier source of the body of knowledge in operations management, including production, inventory, supply chain, materials management, purchasing, and logistics. Since 1957, individuals and companies have relied on APICS for its superior training, internationally recognized certifications, comprehensive resources, and worldwide network of accomplished industry professionals. Business Professionals of America - At the collegiate level provides leadership, professional learning, and networking opportunities at the local, state, and national levels. In addition, members have opportunities to socialize with other business students and faculty. Membership is open to IDEC and BE majors as well as to majors in other program areas in the College of Business. Membership provides an important dimension to the career preparation of business majors. Delta Sigma Pi - A professional fraternity organized to foster the study of business in universities; to encourage scholarship, social activity and the association of students for their mutual advancement by research and practice; to promote closer affiliation between the commercial world and students of commerce, and to further a higher standard of commercial ethics and culture and the civic and commercial welfare of the community.Delta Tau is ISU's chapter of Delta Sigma Pi. Financial Management Association - The global leader in developing and disseminating knowledge about financial decision making. FMA's members include academicians and practitioners across the world. The FMA broadens the common interests between academics and practitioners, provides opportunities for professional interaction between and among academics, practitioners and students. As well as, promoting the development and understanding of basic and applied research and of sound financial practices and enhancing the quality of education in finance. The Financial Planning Association ® (FPA®) is the largest membership organization for personal financial planning experts in the U.S. and includes professionals from all backgrounds and business models. The student chapter provides a means to help students learn more about the profession, build leadership skills, and network with financial planning professionals, students, and faculty. FPA membership is a valuable resource for any student interested in becoming a Certified Financial Planner™. Membership is open to business students. Gamma Iota Sigma - The purpose of this fraternity is to promote, encourage, and sustain student interest in insurance, risk management, financial services and actuarial science as professions; to encourage the high moral and scholastic attainments of its members; and to facilitate interaction of educational institutions and industry through networking and by fostering research activities, scholarship, and improved public relations. Alpha Epsilon is ISU's chapter of Gamma Iota Sigma. Investment Club - The Indiana State University Investment Club was established in March of 2000 when James Oelschlager donated $50,000 to Indiana State University for the establishment of an investment club. The purpose of the club is to teach students about the stock market. MBA Association - A graduate student organization that sponsors professional, social and recreational events to promote increased student involvement and inspire a sense of community. The MBAA represents all MBA students and alumni. Management Information Systems Association - MISA promotes, encourages, and sustains student interest in information systems as a profession. It encourage the high ethical and scholastic attainments of it members and facilitates cooperation with educational institutions, industry, students, and professional persons of Management Information Systems through fostering scholarships, services, and research activities. Beta Alpha Psi - National scholastic honors fraternity for accounting, financial, and information systems professionals. Throughout the year, they host professional presentations and participate in a variety of social and service activities. Corporate recruiters realize the significance and benefit of Beta Alpha Psi and pursue active members for employment opportunities. Beta Gamma Sigma - The honor society serving business programs accredited by AACSB International - The Association to Advance Collegiate Schools of Business. Membership in Beta Gamma Sigma is the highest recognition a business student anywhere in the world can receive in a business program accredited by AACSB International. Insurance and Risk Management Honors Corps - The mission of the IRM Honor Corps is to recognize outstanding academic achievement by Insurance and Risk Management majors and minors; to mentor outstanding Insurance and Risk Management majors and minors and to enhance the connectivity between Insurance, Risk Management, and Financial Services professionals and outstanding ISU Insurance and Risk Management majors and minors. Pi Omega Pi - National undergraduate business education honor society. The aims of this student professional organization include creating fellowship among teachers of business subjects, creating and encouraging interest in business education, promoting scholarship in business education, and fostering civic responsibility and high ethical standards in business and professional life. Since it is an honor society, business education majors must meet a specified grade point average and other high standards to be invited to membership in POP. Membership is an honor that you will want to include on your professional resume throughout your teaching career. According to the Scott College of Business Constitution, student representation is needed on a number of standing committees of the business faculty. Serving a one-year term as a representative is an excellent way for you to provide the student viewpoint for College policy and operating decisions, to network with faculty and administrators, and to demonstrate your participation to future employers. Student members participate in all privileges and duties of the Committees, including the privilege of making and seconding motions, but excluding the privilege of voting. The list of open positions appears below. Applicants will be reviewed by relevant committees before being selected by the Student Affairs Committee.